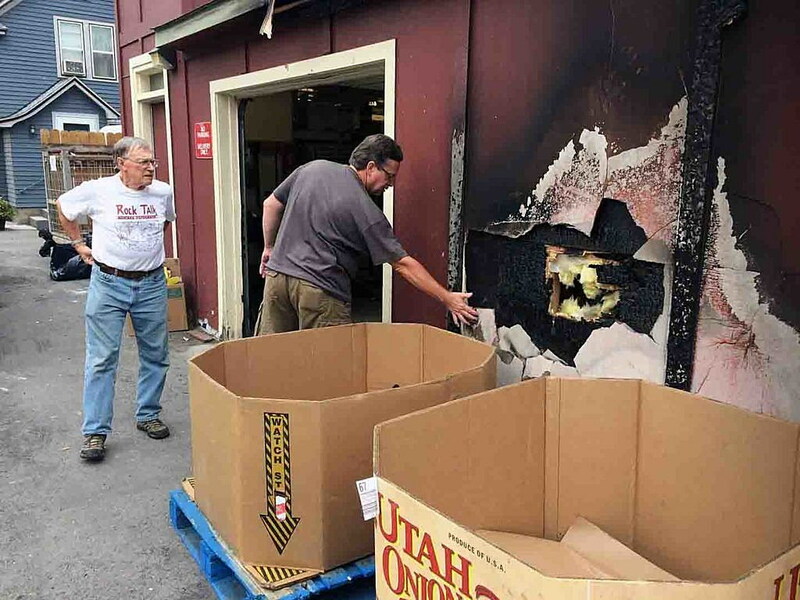 For the second time in less than two weeks, the Missoula Food Bank has been the target of apparent arson, the latest occurring early Wednesday morning. As a security expert inspected the damage later in the day, Missoula Food Bank Executive Director Aaron Brock was left scratching his head, wondering why someone would target the local nonprofit, one that served more than 119,000 clients last year through a variety of programs. The Missoula Police Department is investigating the incident. Brock said fire has been set to the building twice over a nine-day span, the latest occurring at around 2:30 a.m. on Wednesday. On both occasions, the blaze was set in the alley where the Food Bank stores its cardboard and shipping pallets. In the latest incident, the fire spread up the alley wall into the eves, leaving charred wood and exposed insulation. Without the quick response of the Missoula Fire Department, Brock fears the damage would have been considerably worse. The incidents have put the Food Bank in the difficult position of seeking public witnesses without publicizing the latest incident out of fear of motivating the suspect. The fires have forced the Food Bank to store flammable materials indoors, despite an acute lack of space. Last year, the Food Bank served more than 18,400 individuals at its pantry on S. Third Street West, reaching more than 5,600 local households. In doing so, it distributed more than 1.5 million pounds of food and saw some 1,574 volunteers log 27,000 hours to help the Food Bank meet its mission. The Food Bank is currently building a new facility across town and plans to open in April. Brock said the time has come to move, though the recent fires have added a sense of urgency. “Our hope is that our insurance is going to step up the way we think they will,” Brock said. “We have a relatively small deductible. My ask would be for people to watch out for their neighbors.